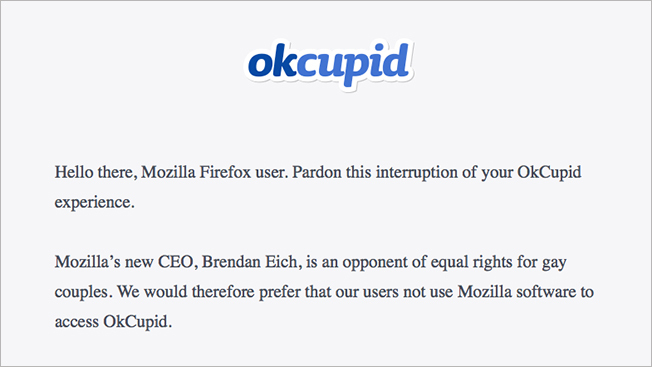 Newly appointed Mozilla CEO Brendan Eich has his share of detractors, but few are more high-profile than massive dating site OkCupid. The site, which gets 10 million unique visitors a month, is currently greeting all Firefox users with a note explaining why OkCupid's owners feel Eich is "an opponent of equal rights for gay couples." At issue is a $1,000 donation Eich made to support California's Proposition 8 in 2008. The constitutional amendment successfully banned gay marriage before being ruled unconstitutional in 2010. OkCupid's roadblock for Firefox users doesn't stop them from visiting the site entirely. Clicking "Continue to OkCupid" at the bottom of the lengthy note about Eich will allow access, but "we urge you to consider different software for accessing OkCupid." Mozilla tried to head off such gestures of protest with a March 29 blog post titled "Mozilla Supports LGBT Equality." Mozilla’s mission is to make the Web more open so that humanity is stronger, more inclusive and more just. This is why Mozilla supports equality for all, including marriage equality for LGBT couples. No matter who you are or who you love, everyone deserves the same rights and to be treated equally. Interestingly, the post also notes, "One voice will not limit opportunity for anyone." It doesn't clarify that point, but Mozilla seems to be saying that its CEO's personal and political opinions don't have any impact on the organization or its customers—a position that can generously be described as naive. Our CEO is not an "anti-gay" activist—in fact he's apologized. And our Board Chair, who is the CEO's boss, is vocally in support of LGBT rights. Mozilla as an organization is staunchly in support of marriage equality and LGBT rights. OKCupid never reached out to us before this, and their boycott page is at the very least factually incorrect.